The GM Coachwork MiniBus Lite is the original and market leading 16 seater minibus (including driver) weighing less than 3.5 tonnes, that any of your staff can drive with a standard manual car licence. 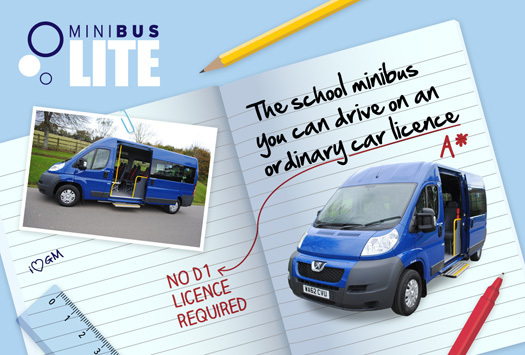 Based on the tried & tested Peugeot Boxer, the MiniBus Lite is available in 5 specifications, including normal width & full width wheel chair ramps. Staff do not need a special licence to drive it (however, we would always recommend assessment & training for health & safety purposes). More staff will be entitled to drive it. Schools can save the time & money needed for their staff to pass the D1 driving test as required for some other 16 seaters.